Screening and panel discussion hosted by Environmental Humanities South. For over a decade, members of the Amadiba community in Xolobeni have expressed their opposition to mining titanium on the sand dunes of Pondoland, on the Wild Coast of South Africa. This community is also opposing the extension on the N2 toll highway that will be required to transport the minerals from this remote rural area. In screening ‘The Shore Break’ documentary, we hope to open a conversation about how to think beyond the language of ‘development’, with its many binaries and trade-offs. How to listen to those affected? How to engage without imposing? How to imbue political voice? How to overcome the binary language of development discourse, which is framed as for or against, either/or, mining versus ecotourism? A Literary Con: The ‘memoirs’ of Herman Charles Bosman and Dugmore Boetie. Conference of the American Comparative Literature Association (ACLA), New York University, 20-23 March 2014. Jeremy Cronin, ‘Inside Out: Bosman’s Cold Stone Jug’. In Stephen Gray (ed. ), Herman Charles Bosman. Johannesburg: MacGraw-Hill, 1986. In How Fiction Works, James Wood distinguishes between reliably unreliable narrators in literature (fairly common and generally identifiable) and the rarer, more disquieting case of unreliably unreliable narrators. This paper relocates his insight to the ostensibly non-fictional works of two South African comic writers: the urban sketches of Herman Charles Bosman, collected in A Cask of Jerepigo (1957), and the prose cycle that makes up Dugmore Boetie’s ‘experimental autobiography’ Familiarity is the Kingdom of the Lost (1969). Often compared in South Africa, yet little known elsewhere, Bosman and Boetie trade in forms of comedy and irony that, I suggest, are uniquely unstable. With satiric targets and strategies liable to shift disconcertingly from paragraph to paragraph, a ‘politics’ that is wilfully opaque and illegible, and a deliberately cultivated sense of tastelessness and irresponsibility – their texts are perhaps best described as elaborately rigged confidence tricks, often at the expense of the earnest, bien pensant reader. Nonetheless (as glutton for punishment), I will attempt to trace the workings of a complicitous and guilty narrative pleasure: a strain of South African comic vernacular that is echoed in the work of later writers like John Matshikiza, Marlene van Niekerk and Ivan Vladislavic. I will also reflect on the difficulty of teaching (and then resolving never to teach) Bosman and Boetie in the multiracial context of a South African university – perhaps out of an anxiety that students might not ‘get the joke’; or perhaps because they have intuited that some jokes are not worth getting. Land and literary non-fiction from Sol Plaatje to Jonny Steinberg. The ‘story of an African farm’ is one of the most overworked motifs in South African literary history. Within ‘white writing’ from the region, it seems that almost every novelist has (along the lines of Dinesen’s 1938 memoir) ‘had a farm in Africa’, whether actual or imagined. At the same time, from RRR Dhlomo’s An African Tragedy (1928) onward, much writing by black South Africans has been classed as fundamentally urban: underpinned by a move away from rural areas to the city, and taking as its subject the encounter with modernity that ensues. This paper hopes to unsettle these familiar trajectories, by tracking how South Africa’s arable land appears in long-form non-fiction... Ranging from Sol Plaatjes’s Native Life in South Africa (1916) to the work of Charles van Onselen and Jonny Steinberg, it considers major South African texts that return to the rural, and ways of writing about land that rely on testimony, oral history and reportage. As such it asks for an alternate genealogy of the African farm, one that includes the voices obscured or effaced by South African versions of the pastoral (or anti-pastoral). Yet at the same time, the complex projects of collaboration and cultural translation that produce texts like Van Onselen’s The Seed is Mine (1996) and Steinberg’s Midlands (2002) pose other, difficult questions about how access to land and access to narrative become implicated in each other. 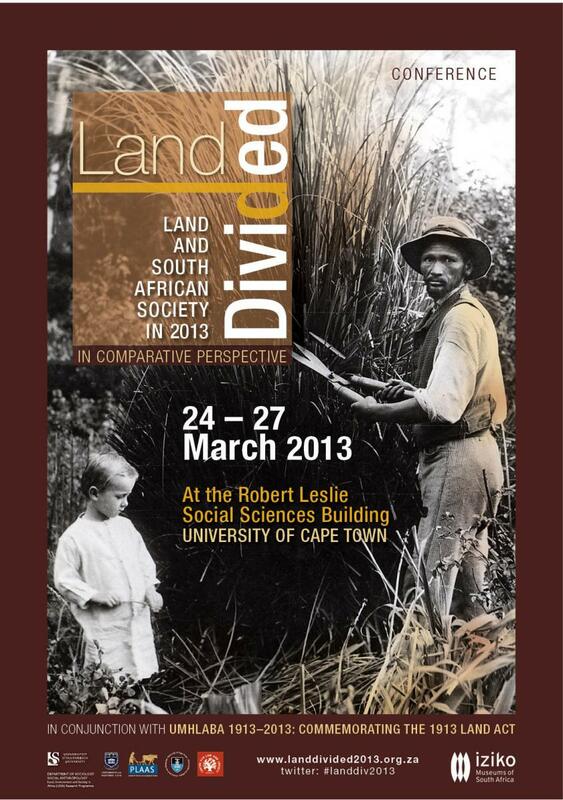 A Land Divided | 24-27 March 2013 | University of Cape Town. Land and South African Society in 2013 | A Comparative Perspective. Extracurricular workshops for students looking to develop their written skills. UCT Conference on Teaching and Learning | 2012. Many who teach in the field of literary studies at UCT feel the need for a forum which provides writing support to students within our discipline, especially since our work requires a particular attention to the handling of language. We have noticed that quite serious problems with essay writing persist into third-year undergraduate courses, and would like to redress these. At the same time, we hope to develop a writing programme that goes beyond just remedial sessions or the idea of a ‘writing clinic’. Indeed, redefining the matter of (student) writing as a practice, a discipline and a long-term intellectual project – rather than a problem – will be central to the approach. In this conference I hope to explore the idea of academic writing in a wider, more dynamic and creative way. Who says, after all, that scholarship should be any less ‘creative’ than the MA programme for novelists, playwrights and poets? ‘What we talk about when we talk about writing’ (apologies to Raymond Carver) will be aimed at committed students who are looking to hone their written work, to have it read regularly by their peers, and to become fluent in a range of different scholarly registers: from careful archival research and peer-reviewed journal articles to more public modes like the essay and the review. ...to Conrad of the Karoo: The making and unmaking of literary reputation in the late 19th century. Outposts of Progress: Joseph Conrad, Modernism and (Post)colonialism. International Conference in Cape Town, December 2011. Kipling to James Conland, 24 July 1900.